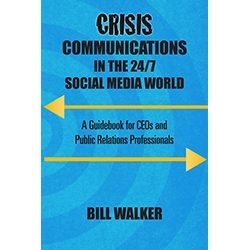 "Crisis Communications in the 24/7 Social Media World by Bill Walker"
Don't wait until you're faced with a Crisis--Order your copy now! In today's 24/7 social-media world, judgment will take place in the court of public opinion, which is a court of law turned upside down--you're guilty until proven innocent. Every experienced CEO and Director of Pubic Relations knows that their organization could experience a crisis situation and that more often than not, the situation will unfold at a pace that leaves little time for a spokesperson to consult with management advisors. When faced with a disastrous crisis, there will often be a huge disconnect between your instinct about how to react and the public’s expectation of how you will react, and this simple truth lies at the core of most crisis communications situations. How you handle a serious crisis in the first developing hours, will often determine whether your organization will survive the blow and have a chance to recover. 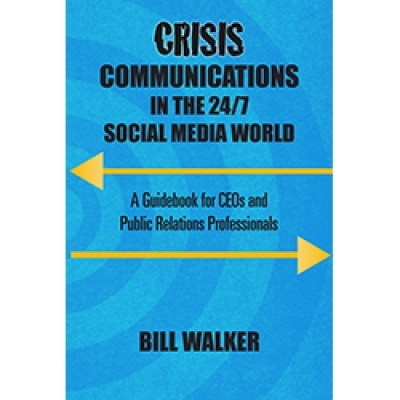 Bill Walker has lived in the trenches of several major crises, and his writing reflects both his experience and his empathy for those responsible for guiding organizations large and small through the gauntlet of news media, employees, customers, lawyers, regulators and other stakeholders. In Crisis Communications in the 24/7 Social Media World, Walker explains that the ONLY approach to take is to focus resolutely on the public interest. Actions or reactions based on self-interest will drag you down. The key to surviving a crisis lies in preparing for the inevitable by building relationships with media allies and strengthening your corporate or brand image ahead of time--not after the crisis hits. When well managed, a crisis can be an opportunity to cement relationships with your employees, business partners and customers, and to grow both your company and your career. As one early reviewer put it, "This book is a good reminder that it’s most important to act with integrity during a crisis – if you do, the public relations will take care of itself."